However, by 125,000 years ago, the global SST increased by 0.5° ± 0.3°Celcius, reaching a temperature indistinguishable from the 1995-2014 average. These results suggest that LIG global mean annual SSTs simulated with most global climate models are too low. As well, the data show that the Atlantic Ocean in the Northern Hemisphere was cooler at the beginning of the LIG, compared to temperatures in the Southern Hemisphere. What caused the changes in the last interglaciation? At the same time, the thermal memory of the seesaw response in the SH extratropics, likely associated with sea-ice retreat (27, 28), combined with CO2 forcing (Fig. 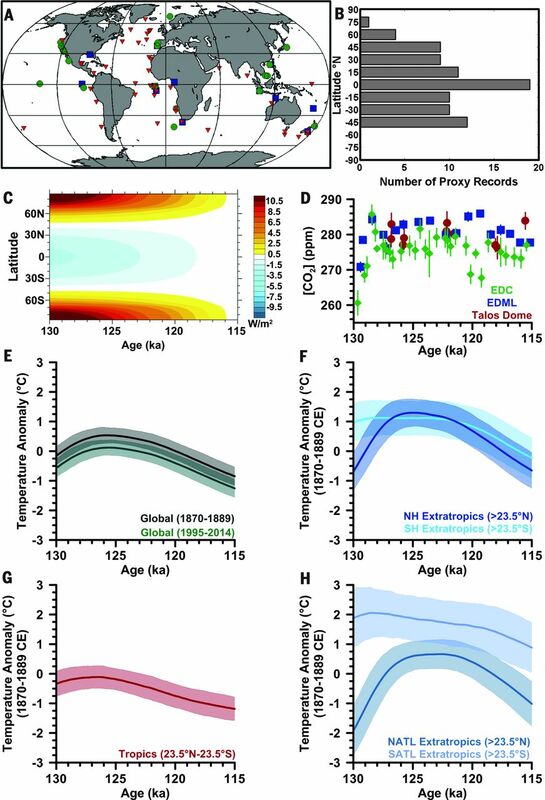 1D) to sustain warm SSTs there, thus resulting in the symmetrical high-latitude warming seen in our reconstruction (Figs. 2B and 3), as well as the warmer global SSTs than those simulated in global climate models that do not include the sea-ice feedback (3, 4). Subsequent high-latitude cooling through the remainder of the LIG (Fig. 1) then likely occurred in response to the dominant obliquity forcing (Fig. 1C) and associated feedbacks (4, 29). He said that heating up the “depths of our vast oceans” to the point where sea levels reached that point would take thousands of years “so sustained and substantive cuts in greenhouse gas emissions from energy-intensive activities remain vital and beneficial to societies”. And Professor Michael Mann, a renowned climate scientist from Pennsylvania State University, described the studies findings as "sobering". He continued: "It indicates that we may very well already be committed to several more metres of sea level rise when the climate system catches up with the carbon dioxide we've already pumped into the atmosphere." Dr Mann added: "That is actually consistent with some model simulations. The important thing to recognise is that the climate system hasn't yet come into equilibrium with the increase in carbon dioxide, so it is misleading to compare the historical sea level rise we've seen so far with the sea level rise 125,000 years ago, because the latter indicates the full response [to the warming effect]." Not too surprisingly, the study has been ignored by the mainstream media. Why? He's wrong. It could be that Bob's notion of mainstream media is different to that of most people. Or it could be just his conspiratorial paranoia took over and caused a blind spot when he did a Google search. Thing is, despite the fact that the paper was published on the same day that the press around the world was obsessed with Donald Trump's inauguration, this new research wasn't ignored (see here and further reading below). Understanding how warm intervals affected sea level in the past is vital for projecting how human activities will affect it in the future. Hoffman et al. compiled estimates of sea surface temperatures during the last interglacial period, which lasted from about 129,000 to 116,000 years ago. The global mean annual values were ∼0.5°C warmer than they were 150 years ago and indistinguishable from the 1995–2014 mean. This is a sobering point, because sea levels during the last interglacial period were 6 to 9 m higher than they are now. Of course, in very basic terms, that suggests today’s sea surface temperatures are still within the range of natural variability, contradicting climate model-based nonsense about current values, while sea levels still have a ways to go to catch up to the past. It's that last para where Bob went wrong. He's right that sea levels will take some time to catch up with the warming. He's wrong when he claims that "today’s sea surface temperatures are still within the range of natural variability". They aren't. The sea is only as hot as it is today because of human emissions of greenhouse gases. I saw one article that claimed the models were just fine and this new result meant that a burst of warming was surely about to occur, so we must act to save the world, or sea levels would rise 9 meters very quickly, …. Its not really propaganda just because you choose to omit certain contrary evidence? #Agendas #FakeNews #Money extracted with menaces. What will our schools do, around where I live the life of a school building is 60 years, they build a new school and tear down the old school. I’m scared. Will we be able to build new schools fast enough to get away from the rising oceans? Dodging rising oceans is as scary as dodging a charging stampede of snails. Just like the oceans, in our sense of time the speed of a snail is slow, but just think how fast that snail moves on geological time scales. We are doomed, think of the children. Remember to always think of geological time scares, if it’s fast at that pace then we humans can’t move fast enough, birds can’t move fast enough, and those poor snails will not be able to move fast enough. Exactly! How do you even measure a global sea temp? Or a global average air temp for that matter? Make something up? 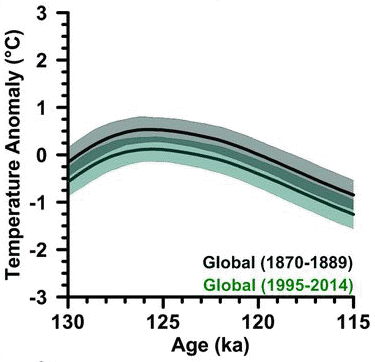 The climate optimum was 4000-5000 years ago. The Holocene will be short-lived in geologic time. TIME’S UP. We’ll be lucky if the current solar minimum results in just an LIA. The last time the oceans got this warm, sea levels were 20 to 30 feet higher than they are today - at the Los Angeles Times. Regarding the quote, "Of course, in very basic terms, that suggests today’s sea surface temperatures are still within the range of natural variability, contradicting climate model-based nonsense about current values, while sea levels still have a ways to go to catch up to the past." I would like to add that, while natural in cause, the changes during glacial and interglacial periods are not simply natural variability, they're externally forced, as were the MCA and LIA. I too often see skeptics talking about these things as being natural variability when that's not exactly what it means. The timescales are important, and you're not really addressing that. 6-9 m of SLR over 4kyr is 0.15 - 0.225 m / century and that isn't exciting. However the seas could rise by 1 to even possibly 2 metres (3 to 6 feet or so) over coming decades as I understand it, which would be quite exciting for those of us still around before the turn of this century. (Not me, but my great nieces and maybe even my nieces will see this). Maybe not exciting for you William. You don't have to wait that long for the impacts. According to this 2014 article from John Church and Xuebin Zhang, in the Asia Pacific, regional sea-level rise will be generally noticeable before 2030 - so in about 13 years. And it doesn't require SLR to be in the metres for it to cause problems. The impacts will probably start with storm surges coinciding with high tide. But not all people living near the ocean have waterfront pools on Sydney's beaches. A lot of industrial land and cheap housing is built on coastal swamps and will need to remediated or moved. It only needs to be high enough to start seeping into the landfill and you only need one flooding event to do severe damage. Every lived in a house with wet floorboards? And a lot of agricultural produce in Asia comes from the large deltas which already suffering from encroaching salt water. I live at 93m so we just have to prepare for the refugees. On a slightly more frivolous note, I have long suspected that ice sheets are melting faster than a lot of predictions suggested, based on almost no evidence BTW. Consensus sea level rise estimate for 400-ppm conditions last seen in the mid-Piacenzian (~3 mya) is 24 meters. There is no reason o expect much different in our future, especially as we will be lucky to cap things off at 560 ppm (close to enough for complete ice sheet melt). For near-future non-equilibrium conditions, even the LIG is a poor guide. Forcing today is not forcing then, and most crucially it's not at all clear that the relatively warm water now being pushed onto the bases of the ice sheets had much of an analog then. "THIS IS A SHOCKING AMOUNT OF MELT FOR AN ICE SHELF TO EXPERIENCE." "Previous studies using other techniques estimated the average melting rates at the bottom of Dotson and Crosson ice shelves to be about 40 feet per year (12 meters per year). Using their direct radar measurements, the team found stunning rates of ice loss from the glaciers' undersides on the ocean sides of their grounding lines. The fastest-melting glacier, Smith, lost between 984 and 1,607 feet (300 and 490 meters) in thickness from 2002 to 2009 near its grounding line, or up to 230 feet per year (70 meters per year)." That's a point. 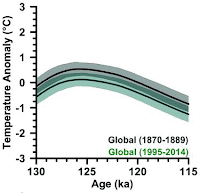 This paper was about that global temperatures back in the last interglacial may only have been what they are now. We are heading for hotter. A lot hotter if some people get their way. That was the first point. The second one supports Hoffman's view as stated to the Graun (as quoted by BBD above). Maybe the best way to put is that the same warming commitment can result in quite different rates of ice sheet melt/sea level rise if the pattern of the forcing differs. Delivery of warm water to the base of the ice sheets is literally the worst thing that can happen in that regard. TBC, this is the excitement William demands. If someone has a bit of time, HEEELP!! "... the thermal memory of the seesaw response in the SH extratropics, likely associated with sea-ice retreat (27, 28)..."
1. What does "thermal memory" mean when you're talking about oceans? 2. I don't understand "seesaw response in the SH extratropics, likely associated with sea-ice retreat (27, 28)". (a) On first reading I visualised heat sort of sloshing from pole to pole until it reached a stable state where the poles were about equally warmer than... than they were before the warming started?? But that would be a global seesaw, not a SH one - wouldn't it? - and would the heat still slosh if the AMOC has broken down? (b) Is, or was, there a hot/cool seesaw between the tropics and the Antarctic - mebbe because there's more ocean in the SH? What's the association between that and sea-ice (SH? NH? Both?) retreat and is it different from what's happening now? 3. My present understanding, which I think fits with Steve Bloom's comments above, is that the take-home from this paper not so much about how warming is working through the oceans now as it about is about refining how the models handle warming. Fair enough? I *think* just that once a large body of water is warmed up it takes a very long time to cool down again, even with interhemispheric circulation taken into account. This has a knock-on effect in suppressing Antarctic sea ice which (a) reduces albedo and (b) allows ventilation of the Southern Ocean crucial to outgassing CO2 into the atmosphere. Both are of course positive feedbacks to the initial NH orbital (Milankovitch) forcing. So you get initial NH warming, then cooling as AMOC turned off followed by SH warming then *symmetrical* temperature increase as GHG feedbacks globalise the warming. Thank you BBD. That makes sense. And it's a relief to tussle with understanding part of a climate system instead of politics. Yes, I think BBD has it pretty right. The bipolar seesaw (climate, not psychology, though that too) has been researched quite a bit. It's a hypothesis that seeks to explain why temperature shifts in the northern and southern hemispheres can get out of phase. I believe that's related to why scientists are concerned that parts of the northern hemisphere might cool with a slowing of the AMOC, as global warming kicks in.